The young college student was startled to hear her college library was closing. “Midnight, already?” she said. She dreaded walking across campus to her dorm alone so late. Bad things had happened recently on campus. A guy emerged from a bar and realized he was further from his apartment that he had planned and had had a couple more beers then he should. The streets would be full of other drunken guys and he’d seen fights over trivial things. If you know anyone who has to take risky walks, there is a new class of apps to help keep them safe. I first read about Companion Safety App in a “Business Insider” article a few weeks ago. I took the unusual step of posting about it first at FamilyTechOnline.com because I was so certain it could help someone and I wanted to gain some feedback on this class of apps before writing about them here. Companion Safety App, available for both IOS and Android, lets you contact a friend and have them walk with you virtually. The friend is contacted by the app via text message. They can accept or decline. More than one person can be asked in one action and the first one to respond favorably acts as the companion. The friend monitors the trip home on a map showing the route. If the walker feels threatened, they can press an emergency button that calls the police. If the phone is dropped, the person breaks into a run or the headphones are snatched away, the phone gives you 15 seconds to press Yes to an “Are you OK?” query. After 15 seconds the app automatically goes into a danger mode and makes an alarm sound that hopefully will scare off most attackers and it contacts your companion. There also is an “I’m feeling nervous” button. Pressing it allows the companion to build a database of areas people do not like, and share that with campus or local police. The companion does not need to have the app, although that helps. They can also monitor their friend’s trip on a web link. The app does not expect you to be talking to your companion. Walkers can remain alert to their surroundings and not distracted by conversation. The program was created by University of Michigan students for other students and it is free. I asked a college friend of ours if she’d heard of this app, and she hadn’t. However, she said it sounded a lot like one Longview University was promoting for students to use. LiveSafe is from a commercial company. The app is free. It has partnerships with several universities in the region including Northern Virginia Community College, James Madison, Old Dominion, and St. Michaels. The LiveSafe app offers a virtual walk home as well as allowing you to chat with your companion, as it shows the companion your route on the way home. The app makes it easy to contact campus police by either the walker or the companion. The companion must also have the app on their phone. The app can share your location information with the police so that in a stressful time, they will know where they are needed even if the caller is flustered or panicky. LiveSafe is set up as a way to promote communications between students and safety officials, both gathering information from students and disseminating information to help keep students safe. Our phones’ ability to communicate by both text and voice – and know and report our location – leads to ways to help keep us safe. These same apps can be used for others, for example those walking from a bus across a dark commuter lot, or someone slugging home from work. Or even a free-range child who finds himself frightened by the walk ahead of him to home and would like a little reassurance someone is at least virtually with them on the journey. This column will appear online Saturday, September 19, 2015 at 9 AM EST. It is available before in the September 18th issue of Prince William Today on sale at these retailers beginning this Thursday, September 17 in the afternoon. Apple’s pending IOS 9 – and Howard Stern’s big mouth – have conspired to bring on what many fear will be a radical change to free content on the web. How many websites do you pay to use? Probably none, although hopefully you subscribe to the Prince William Today so you get unrestricted access to InsideNova.com. And maybe you pay for a couple of the national newspapers as well. Other than that, the content and services most of us appreciate such as Facebook, Google, Google Docs, Google Keep, Google Drive and others are free. Much of the content is free because it is supported by advertisements. For the cost of seeing a few ads along the way, we get to connect with friends, create documents, make lists, store files and much more. What Apple has done is put hooks into the upcoming IOS 9, the operating system for iPhones and iPads, which allows users to install apps to the Safari browser that will block ads. You will still see the web pages as you normally would, but without ads. Sounds great, until you consider the unintended consequences. Ad blocking has been around for quite a while on PCs, but not all that well known or used outside of techies. That’s where Howard Stern comes in. On his Aug. 25 radio show a caller responded to his on-air complaints about seeing ads online, by telling him about ad blocking software. The 61-year-old Stern had never heard of it. And probably much of his audience, average age of 47, hadn’t heard of it until then either. So what had been a quiet secret of techies was pushed more into the open. And now Apple is going to make it easy to block ads on iPhones. I suspect if you asked Apple officials why they were doing this, they’d tell you that it was to make a better experience for their users. They didn’t have that concern when they introduced their own ad sales network, iAd. Cynics suspect it is because iAd has not been able to challenge the Google AdWords behemoth. Google ad sales are so immense they can pour the profit back into the services we use for free such as Drive, Docs, Keep, Calendar, Gmail, etc. They are also for futuristic and attention grabbing things like self-driving cars and efforts to extend human lifespans. And if Apple can take a chunk of profits away from websites maybe it can force websites to instead create apps for the iPhone. The ads in apps will not be blocked and development tools for creating iPhone apps make it very easy to monetize with ads from, yes, Apple’s own iAd. I have never used ad-blocking software. I feel to do so is violating the social contract with the sites I find useful. Not seeing the ads they sell to pay their staff, and pay for their servers and bandwidth is, in my opinion, stealing. Some sites have broken that contract too by having invasive popover ads that are hard to eliminate, or self-running video ads with the sound cranked up. And some ads for products do not have a simple close button, but ones to make you feel guilty. For example an ad for discount cruises have buttons that say “Learn More,” or “I prefer to pay full price.” If site ads irritate me, I don’t block them. I just never go back to the site. You could say I have a dog in this hunt, and that’s true. This newspaper relies on ads, and its online counterpart, InsideNoVa.com, has online ads. Without this income, there wouldn’t be news coverage from the professionals at Prince William Today covering our community. This is a freelance job for me, and I could finance Family Tech in other ways, but the column wouldn’t be part of an important civic component. If ad income, already challenging as a monetization strategy, takes a major hit, some sites will disappear and the survivors will have try new strategies. One appearing more and more is ads that look like articles on news sites. While labeled as an ad, the label is not noticed by many readers who think they are reading a review of a new car, instead of an article written by the car company itself, for which the site was paid to publish. Or maybe micropayments might take off. You might see an article on how to repair a broken pipe and have to pay 99 cents to read it. That is something I’d like to see. If you buy a magazine for $6, and find three of the articles in it useful, you are already paying $2 an article. Why not take that strategy online? Micropayments could be a great way to encourage writers to generate informative articles, investigative pieces, short stories and even the most niche products will find an audience who will support them financially. This column will appear online Saturday, September 12th, 2015 at 9 AM EST. It is available before in the September 4th issue of Prince William Today on sale at these retailers beginning this Thursday, September 10th in the afternoon. I looked to the left and was surprised to see a fighter jet there. Even more astonishingly, I looked up and found another fighter just above my head, only feet away from my own aircraft. A voice startled me and I looked behind me to realize I wasn’t alone in the plane; there was a pilot behind me. The Family Tech gadget budget is – shall we say – “restrained” so I wasn’t flying my new F-35, but instead my $20 Google Cardboard. Virtual reality, or VR, may finally be poised for the home. VR goggles let you see different views as you turn your head. Imagine you are wearing VR goggles and it appears to you that you are at the Udvar-Hazy Air and Space Museum near Dulles. In front of you is a big silver-colored airplane. If you turn to the right, you see more airplanes. Look up and you see a variety of planes hanging over your head. Look down and you see the floor. While it’s not as good as being there, you get a sense of what it is like to be there. Imagine that kind of view if it was dynamic. Games will be able to create constantly changing scenes around you. For a race car simulation game, it will mean you can look up at the mirror, look beside you and look around as you would in a real car. For a combat game, you’ll see your squad around you. Looking up you’ll see a sniper in the window or a plane about to strafe your position. And they have non-game uses. Therapists use them to help people overcome phobias. It’s better to introduce people to virtual heights gradually using VR. Imagine the uses in education. A virtual planetarium controlled by the individual student, for example. The military has been using VR for training for years. Science and engineering can use VR to explore and educate on complex concepts. Imagine previewing a home to buy using VR. Facebook believes in VR. In March 2014, it purchased Oculus Rift for $2 billion. Oculus is to be released in 2016. It will be combined with a wireless controller so people can interact with the environment as well as see it. Shortly after finishing our gaming PC build, the beautiful 34-inch curved monitor we couldn’t afford dropped in price a bit. I told my son we should start putting money aside and with more price drops, we might be able to afford one in time. Instead, he pointed out that by the time we could afford the monitor, VR would probably be the way to go for games. Valve, a provider of downloadable PC games, has its own VR headset coming, from Taiwanese phone manufacturer HTC. Pricing and delivery dates are up in the air for both devices but might be in early 2016. Oculus has said that the cost of a PC supporting the Rift, and the Rift itself, will be about $1,500, making some believe the Rift by itself will be about $300. Others are producing augmented reality goggles instead of virtual reality. Microsoft’s Hololens is one. It shows you what is truly around you, but overlays information. It is not unlike the view you get now in a video game where a character’s name, power, etc. hover over a character. I’m more excited about augmented reality for non-gaming uses. Imagine walking through a trade show wearing glasses designed with augmented reality. If someone you know approaches you, it could use facial recognition to remind you of their name, job, when you last met, etc. CastAR, a pending AR solution is getting a lot of attention, and funding from Andy Rubin, creator of the Android Operating System. 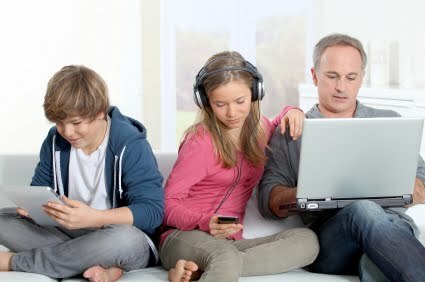 A video showing its potential is on this week’s link post at FamilyTechOnline.com. I try to write in this column only about things than can help families now, but I wanted to touch on this since you will be hearing a lot about VR and AR in the coming year. A couple months after Facebook spent the $2 billion for Oculus Rift, Google gave away VR goggles to developers at their Google IO conference in June 2014. Google Cardboard is a small cardboard box with some special lenses in it. You slide in your Android or iPhone running the free Cardboard app and it gives you VR. Sensors already in the phone know when you have turned your head, or raised or lowered it. What you see changes as you move. Some Android phones let you shoot photospheres, the 360-degree photo I mentioned. The one I described above is actually made at the Air and Space Museum and is on the link post. Youtube has a 360-degree video channel you can watch within Cardboard too. Links to all that, and where you can buy Cardboard for $5 and up, are on the link post. Learned about this app in a Business Insider article today. It seems like a wonderful idea to keep people safe on long walks in the dark. It was designed by college students, for college students walking across a dark campus at night. Companion lets you reach out to family, friends or your campus police and have them keep an eye on you as you travel late at night. Wherever you go, get there safely with a Companion! All you have to do is enter your destination and select some contacts to be your Companion. They don't even need the app installed. These Companions see a live map of your progress and get updates as you make it from Point A to Point B. If you start running, don't make it to your destination on time, have your headphones yanked out or your phone falls to the ground, we will check in on you to make sure everything is okay. If you don't respond in 15 seconds, we will automatically alert your Companions. Please share with anyone you think would benefit from this. Does anyone use these? If you do,or you begin, could you give me feedback? It seems like a great Family Tech column topic. This column will appear online Saturday, September 5, 2015 at 9 AM EST. It is available before in the September 4th issue of Prince William Today on sale at these retailers beginning this Thursday, September 3rd in the afternoon. Just saw this camera on a website. It takes 360 degree videos and costs $349.00. Here is a video taken with one suspended below a drone.